That is not stating 2008 fitment. Which is your point. There are some exhaust diameter differences at work here, that something "fits" is a serious issue. Fitting and performing well are two different claims and I think I am very confused by them, enough to hang onto my money a little bit longer. Why not get the Milltek? Bolts right on with no fitment issues or anything. Just a heads-up for NON-S owners, Magnaflow now has a cat-back system for the Non-S! Will an 12'/13' "S" Rear Bumper fit on a 13' non-S roadster? Looking to get an "S" aftermarket exhaust w/ Bumper. I might ask your dealer what body shop they use regularly and ask about the S bumper fitting on a non-S. Do you already have some working on the exhaust? Are you moving it down the center or something else? A friend has a brand new 2007 R56 Rear Pepper White Bumper and the dealership said that wouldn't fit...different mounting points & the 12/13 Rear Bumper should work...$376 & some change. I checked w/ my Mechanic and he could do the exhaust but wouldn't have any heat shield in the area...didn't give me a price yet...My mechanic recommends going w/ a resonator & 2nd Cat delete ($40)..first...and if I don't like the sound then go with a custom exhaust (magnaflow) or any aftermarket non-s exhaust built for the car...it's mainly for sound on the Non-S...the custom exhaust or aftermarket, would look cleaner, cheaper to install...My mechanic is also a MINI Owner. I'm leaning towards my mechanic's suggestions. To answer your question...I was thinking down the middle. Well got the Milltek it sounds nice. Local company got it straight from England. After installing the K&N Typhoon intake kit, I became interested in upgrading the exhaust too. So I visited a muffler shop and asked for a Magna Flow muffler. Muffler guy heard how my car sounded and said, "Let's take your muffler off and go from there." Muffler was chopped off, and car sounded amazing with the stock cat and resonator on. So he welded on a straight pipe and attached a wider diameter tip to it. He even painted the tip matte black for me. I get some burbles, but not a whole lot. 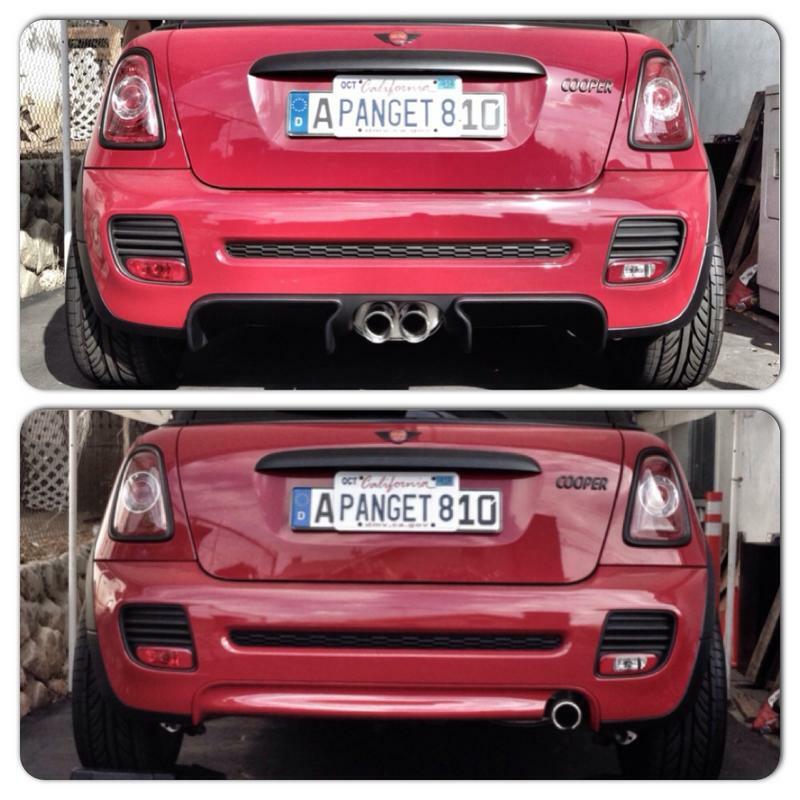 My mini is no longer gagged on both ends. Sounds great can you make a sound clip please ? I am quite curious on the sound? Well I only get burbbles decelerating from a fast speed but they don't last long. Most of the sound does come from my intake (DDM) which I love. 3 Coopers 2 1st Gen, 1 2nd Gen all had a DDM. They people are so nice both dave and Ivey. I realized that I was riding in first gear while circling the parking garage (at 5 - 10 MPH). Do that for a minute or two, then gently let off the throttle, and the melody of burbles begins! Wouldn't mind seeing some pics of this. I must be loud... But you also said that you hear your intake more than the exhaust. Granted, an intake growls nicely, but without a muffler I'm surprised it's not AT LEAST as loud the intake. Ever have someone else motor for you and you listen outside? I'd be curious about that. I've been rolling around the idea of an exhaust for awhile now - just can't really come up with the money or I spend it on something else completely... This also sounds a lot like the B-spec set-up. Pics of that tip would be cool, too. I uploaded a few pictures into the member gallery. The pipe and tip are both generic, not brand-name or anything. A friend is going to help make a sound clip with an iPhone. He has an R53 with DDM CAI and straight pipe, sound clip on FB. If you already have the DDM intake, it doesn't hurt to take the muffler off and go straight-pipe. It makes a world of difference. I cannot believe that I didn't do this sooner. The stock muffler is really heavy, so this mod at least helps improve performance by weight reduction. Find your local muffler shop and see how much it costs. It might be much less than $150! Just picked up my Justa on Saturday. Thinking about letting it breathe better, looking at intake and exhaust. From my quick research online, the VIP is pretty tempting, but I'm not really familiar with VIP, and curious about the build quality and customer service. Milltek, Borla, etc. are all familiar names, but all bring a premium price point for something pretty simple. Is VIP one of those small shops that makes good quality stuff for a reasonable price? Also, any drone with the VIP? Drone at highway cruising speed is a deal breaker. Last edited by wcpfour; 11-14-2013 at 07:08 PM. Sounds good enjoy the christmas gift both can be had from Way Motorworks. My wife tends to say go for it! As I recall, the stock exhaust system is one piece cat-back. So you will still need to cut the stock system in order to fit the VIP.